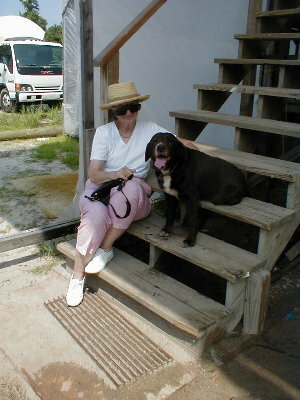 August 29, 2003 The Cherokee work facility is now the creek itself, as she’s been sitting dockside since early July. How strange to realize the vessel is slightly moving while the crew works away! Advantages of a watery berth include getting to test out the engines (although the shake-down cruise has not happened yet). Disadvantages include FishDoc dropping the digital camera overboard. 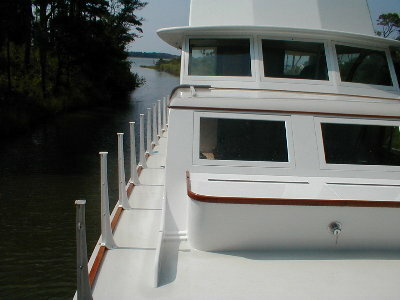 Below are the newly installed stantions, which will hold the mahogany railing to help prevent people from dropping overboard. 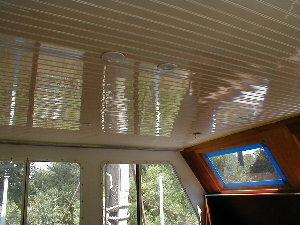 The air-conditioning system is up and running, much to the crew’s satisfaction on these stifling August days. 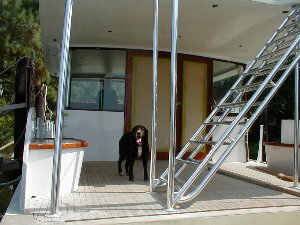 Below, Casey welcomes us aboard from the stern of the boat, hoping his sweet sad eyes and wagging tail will inspire at least one person to let him inside the cool cabin. To the right is an inside shot of the double doors, still with protective paper over the glass. 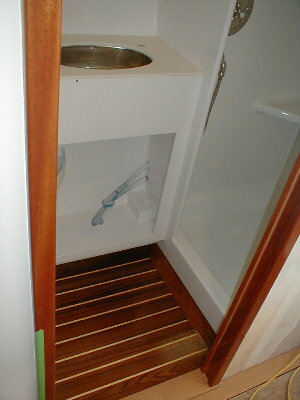 The shelf to the right of the doors holds the guest sign-in book, and to the right of that is the stairwell leading down to the master stateroom and guest quarters. Directly through the double doors we come to the pilot house console. 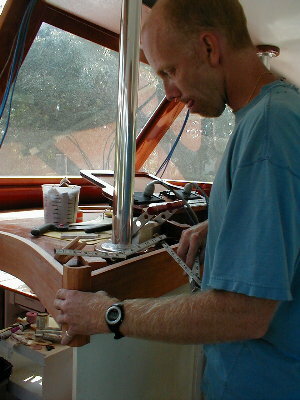 Tom Parker is building and installing all the mahogany trimwork around the wheelbench (dashboard) and the companionway to the galley. To the left of Tom are the stairs leading down to the galley area. 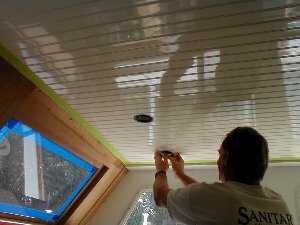 The final paint has been applied to the ceiling since we last checked in, and bottom right shows Steve Gilpin installing the last ceiling light. The black ring near Steve’s hands is one of the surround-sound speakers that have been installed by Bill “Surround Sound” Brown. 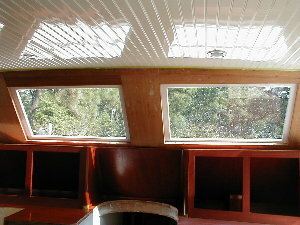 Below deck, the flooring has been installed in the heads. The remaining floors in the staterooms and hallways will be plush with carpet. Carpeting, of course, will be one of the last items to be installed to avoid staining and scuffing by messy work dudes and dogs. Above, Bryan and Tom are helping Chris decide how to best terminate the wainscoting edge against the door casing. 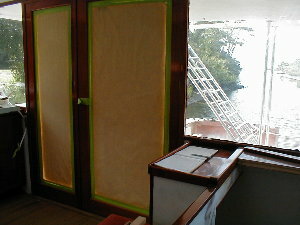 The wainscoting along the hallway area will be varnished. 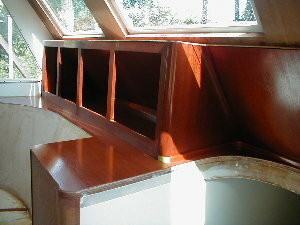 Squeezing past them and stepping up into the galley area again, we turn and see that the shelfing on either side of the stairs is cut, varnished, and fitted. Notice that the new windows are installed as well. Below, Tom Darden’s mother, Lynn Darden, thanks Casey for the tour.